These are the most common questions we get asked about portable generators. People are particularly concerned about the noise that their generator can produce. The noise levels (or decibel ratings) now become one of the most important factors when evaluating a portable generator. We all want the best portable generator with a minimum noise! After years of using and testing dozens of portable generators, we know which models are quiet and which models are loud. But it’s hard to describe exactly how quiet a portable generator is. So we recently ran a noise test on some of the quietest generators on the market and measured the noise levels of each model by a decibel meter. We’ve written down the actual decibel ratings of each model and show you in a table below. We don’t think these numbers will give you the full sense of exactly how quiet a generator is, but we believe, this is enough to answer the question “what is the best quiet portable generator available to buy today?”. As the name suggests, the Honda EU2200i is super quiet. This portable inverter generator is among the WORLD’S QUIETEST GENERATORS, and it was also the quietest one in our noise tests. The Honda EU2200i is even about 1 decibel quieter than the legendary top-selling Honda EU2000i model, it also has a more powerful engine and delivers 10% more power than the EU2000. Combined with ease of use and simplified maintenance, the EU2200i is a best quiet generator for recreation, camping, tailgating, home backup power, and much more. Sound is one of the major advantages of Honda inverter generators. In the noise test, at no load with Economy mode turned on, the Honda EU2200i was extremely quiet. It generated only 57 dB from 20 feet, which was quieter than all 2000-watt models we’ve ever seen. When we turned Eco Mode off, the noise jumped to 59dB but was still very quiet. At full load with Eco Mode turned off, the EU2200i generated only 67.5dB at 20 feet, while most other cheaper portable generators exceeded 70dB. The noise we heard from the EU2200i was mostly low frequency, low humming tone. You will feel very comfortable even when you stand next to the generator when it’s running. In our opinion, you can’t go wrong with Honda’s inverter generators, they are the best choices when it comes to quiet, dependable, durable and easy-to-use generators. They have been proven to last at least 10 to 15 years. The Honda EU2200i portable inverter generator always delivered power constantly and reliably. It always started without a problem and without wrenching shoulders or straining muscles. 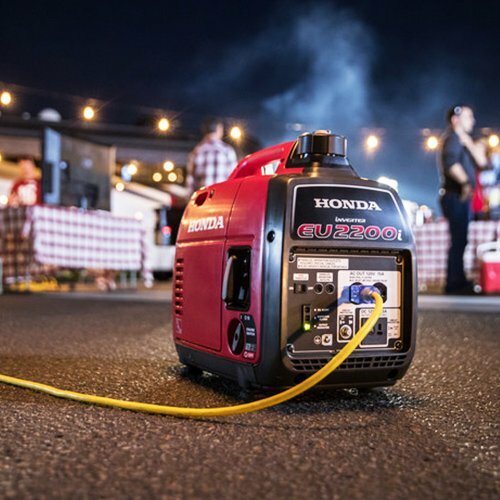 If you want to be able to rely on the generator as a reliable source of power for your home, camping or tailgating, the Honda EU2200i makes the most sense and is a worthy investment. The Honda EU2200i portable inverter generator is also available in 2 other versions in the same lightweight, noise levels, and capacity. The Honda EU2200i Companion is ideal for RV use or paralleling with another EU2200i. The Honda EB2200i is designed specifically for job site; it can operate a wide variety of power tools, such as sliding compound miter saws, air compressor, nailers, and jobsite radios. One of the most surprising portable generators we tested was the WEN 56200i portable inverter generator. 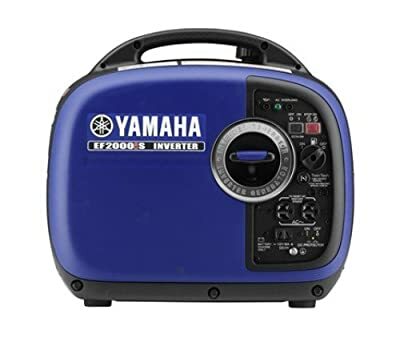 This is among the cheapest 2000-watt generators on the market, but was also one of the quietest portable generators in our noise tests. It was only slightly louder than the Honda and the Yamaha generator under both Eco Mode or a full load. As you can see in the chart below, the WEN 56200i generated less noise than most other more expensive portable generators under a load, that is truly impressive! What makes this inverter generator more compelling than its quiet operation is the very reasonable price that it offers. It’s only less than half the price of either the Honda or the Yamaha but having similar capacity and performance as them. Plus, the WEN 56200i’s engine is a clone of Yamaha EF2000i MZ80 engine (80cc), which allows the generator to run quietly and fuel efficient. You could expect it has similar reliability to the Yamaha. You can even connect the WEN 56200i and the Yamaha EF2000i in parallel. 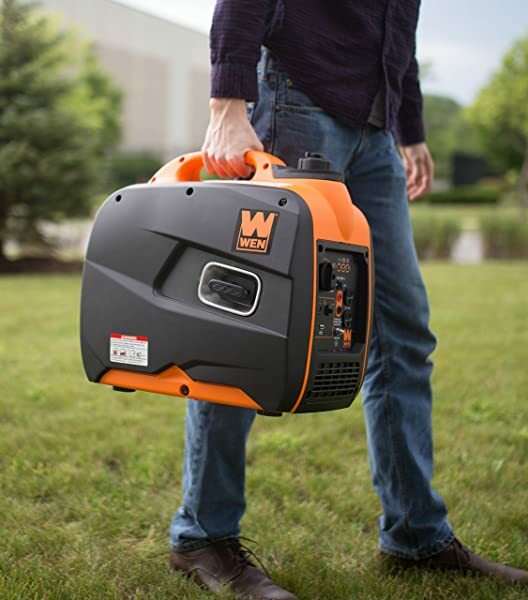 For the most part, we think this WEN generator is the best quiet portable generator for those who are looking for a lightweight, compact, and reliable portable generator but don’t want to break the bank. On performance and durability, the Honda is the clear winner, but on price, the WEN wins. 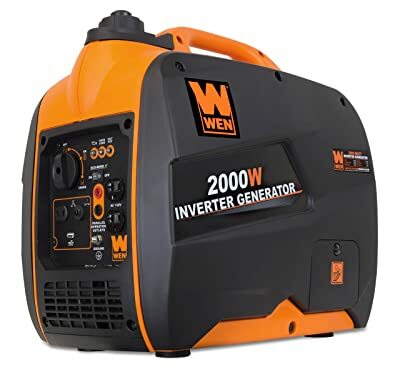 If you’re going to use your portable generator for recreational activities like camping or tailgating, consider buying the WEN 56200i portable inverter generator. During the day your generator’s noise might have blended in with the rest of the background noise we create – cars, trucks, radios, and conversations – and not seemed obtrusive. But in the evening, the time we’re relaxing and going to sleep, a very little noise could sound be amplified, even if you have a super quiet portable generator, turning it on at night will likely make others feel annoyed and angry. 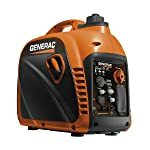 So how do you get electricity at night while camping or tailgating without running a portable generator or having an RV deep cycle battery system? A high-capacity portable solar generator like the Goal Zero Yeti 1400 Lithium Portable Power Station may be the best solution for you. Unlike traditional generators or inverter generators, solar generators don’t run on gasoline or propane. This kind of generators capture the sun’s energy via solar panels, store that energy in a battery bank, and release it through an inverter to be used for standard AC power. Solar generators work in a way that is similar to the solar battery storage systems at home, the only difference is that solar generators are portable, which you can put in your car and bring with you anywhere you go. A solar generator doesn’t produce too much noise as a traditional generator or inverter generator does. In fact, it makes barely any noise when in use. Therefore, if you’re looking for the best quiet portable generator that you can feel free to use anytime or anywhere, no matter it’s day or night, a portable solar generator should be your best bet. Another reason that made we thought about recommending a portable solar generator to you is that it can be safely used indoors as it has totally no emissions. So it’s a great generator to keep the lights and your home security cameras on during power outage. The Goal Zero Yeti 1400 is one of the best portable solar generators on the market. It 1,425Wh battery capacity with 132Ah and 10.8V easily powers devices ranging from lights to laptops and mini refrigerators to power tools. The Yeti 1400 provides almost the same continuous power as a 2000-watt portable inverter generator with much higher surge capacity (up to 3000W). If you feel 1425Wh not going to be enough for your power needs? Consider buying the Goal Zero Yeti 3000, which is able to store up to 3,075Wh. Remember that this solar generator is only our recommendation for you as an alternative to the noisy conventional generators. It wasn’t in our decibel and noise tests. Now, before you go deeper into our comprehensive reviews for some of the best quiet portable generators available, let’s talk a little about the inverter generators and noise. Why Should You Invest in Inverter Generators? Conventional generators, such as the Westinghouse WGen3600, are the most widely used today, also because they have been around the longest. They run on diesel, gasoline or propane, which in simple terms, powers a motor attached to an alternator that produces electricity. The motor of conventional generators run at a constant speed (typically 3600 rpm) in order to produce electricity with the desired characteristics (120VAC @ 60Hz). If the engine speed varies, the qualities of the power generated also change, which is clearly undesirable, so the engine speed must remain constant, and with that comes the constant noise of a generator running at full speed. Inverters are a recent technology, which adjusts the electrical characteristics of the power produced using microprocessors and special electronics. Unlike conventional generators, inverter generators can control generator motor speed accordingly. This means that the engine can adjust according to the power load needed, saving fuel and substantially reducing noise. Designed to mirror a pure sine wave, inverter generators are also safer to run sensitive electronics, such as Bluetooth speakers. So if you want the best quiet portable generator for your home, RV, camping or tailgating – a portable inverter generator is the best choice. Understanding Decibels – How Loud is a Generator? Have you ever heard of decibel? Why the decibel ratings are the key to determine the quietest generator? The decibel (abbreviated dB) is the unit used to measure the intensity of a sound. The decibel scale is a little odd because the human ear is incredibly sensitive. Your ears can hear everything from your fingertip brushing lightly over your skin to a loud jet engine. In terms of power, the sound of the jet engine is about 1,000,000,000,000 times more powerful than the smallest audible sound. That’s a big difference! On the decibel scale, the smallest audible sound is 0 dB. And 0 dB is also the quietest sound audible to a healthy human ear. The relative loudness that we perceive is a subjective psychological phenomenon, not something that can be objectively measured. Most of us perceive one sound to be twice as loud as another one when they are about 10 dB apart; for instance, a 70dB portable generator will sound twice as loud as a 60dB portable generator. Yet that 10dB difference represents a tenfold increase in intensity. An 80dB portable generator will sound about four times as loud as a 60dB portable generator, but in terms of acoustic intensity, the sound it makes is 100 times as powerful. How loud is your portable generator? Normally, 80dB is considered very loud, 70dB is moderately loud, 60dB is fairly quiet, and 50dB is very quiet. A vacuum cleaner weighs in at 70dB, office or restaurant conversation weighs in at 60dB, and quiet conversation at home at about 50dB. A 1dB increase in sound level is barely noticeable to the human ear. In fact, you have to raise a sound level by 3dB before most listeners report a noticeable or significant change. Here are some common sounds and their decibel ratings. These ratings are taken while standing near the sound. The Honda EU2200i Inverter Generator gets almost all four and five-star ratings on Amazon.com. Is that enough to prove how good it is? No other portable generators available today can come close to the quality and reliability of the Honda portable generators, even Yamaha generators. Honda’s generators are really good and always run stability, quietly, and fuel efficient, which will save you a lot of money in the long run. 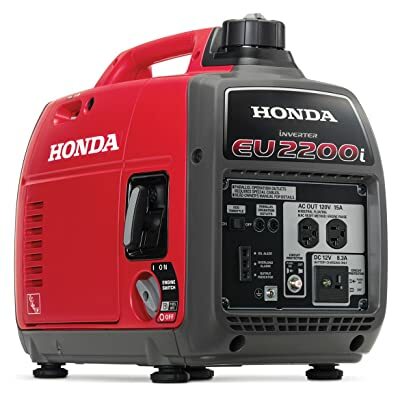 The EU2200i features the most advanced inverter technology from Honda, it’s super quiet, lightweight, and has a solid build. If you’re looking for the best quiet portable generator, the EU2200i is absolutely one of the top choices. Coming back to our decibel tests, the EU2200i produced less noise than all other portable generators. Simply put, it is the quietest portable generator we’ve found. At no load with Economy mode turned on, it generated only 57 decibels from 20 feet, which was quieter than all 2000-watt models we’ve ever seen. When we turned Eco Mode off, the noise jumped to 59dB but was still very quiet. At full load with Eco Mode turned off, the EU2200i produced only 67.5dB at 20 feet, while most other cheaper portable generators exceeded 70dB. The noise we heard from the EU2200i was mostly low frequency, low humming tone. You will feel very comfortable even when you stand next to the generator when it’s running. What makes the Honda EU2200i so quiet? The EU2200i portable inverter generator is powered by the Honda GXR120 engine – which is a legendary engine. This 4-stroke 3.6 horsepower engine was originally developed as an ideal source of power for rammers – equipment used to compact soil or other granular material. With superb durability and reliability for these heavy-duty applications, the GXR120 is more than ready to meet the high demands required. This engine is more robust than the engines of all other portable generators listed in this article. The GXR120 engine has a newly designed compact muffler that reduces operation noise by 1 decibel (dB) compared with the current Honda GX100 engine that powers the outgoing Honda EU2000i inverter generator. A simple but innovative lubrication system with a dual-breather chamber optimizes engine lubricating performance. In addition, an automatic decompression system allows for easy engine starting, while an Oil Alert feature prevents the engine from operating if the oil level is too low. Why the Honda EU2200i is one of the best Camping generators? The EU2200i generator is one of the best quiet generators for camping and tailgating because it has the right power packed in a compact and lightweight design. This inverter generator is packing 2200 starting watts and 1800 running watts. This would be enough for most of your power needs when camping. You can use the EU2200i to power a variety of appliances, including televisions, microwaves, refrigerators, and even small window air conditioners or small portable air conditioners. When needing more power, the EU2200i allows you to add a second EU2200i for additional power. Two identical models can be paralleled with an optional cable for up to 4400 watts of power. The EU2200i will also parallel with EU2000i models. Equipped with Honda’s exclusive Eco-Throttle System, the EU2200i runs 3.2 to 8.1 hours on just a 0.95-gallon tank of gasoline, depending on the load. More details, it’s able to run 3.2 hours at full load, 6 hours at 50% load, and 8.1 hours at 25% load. With less than 47 lbs in weight and a built-in handle, the EU2200i is very easy to transport and store. It is also designed for quick and easy starting. Honda’s automatic mechanical decompressor system significantly reduces the amount of force needed to start the engine. This was the only model that started on the first pull every time – even after we drained the fuel tank dry. Honda guarantees the EU2200i for three years, and the warranty covers all the parts. But you could expect this inverter generator to last at least 10 years. This has been proven. The Honda EU2200i inverter generator is our pick for the best quiet portable generator money can buy. It’s pricey, but it’s a worthy investment. It’s a perfect camping companion. But if you don’t have much cash to invest in a portable generator, consider the generator model below. One of the most surprising portable generators in our decibel test was the WEN 56200i portable inverter generator. This generator is among the cheapest 2000-watt generators on the market, but was also one of the quietest portable generators in the test. It was only slightly louder than the Honda and the Yamaha generator under both Eco Mode or a full load. As you can see in the chart below, the WEN 56200i produced less noise than most other more expensive models under a load, this is truly impressive! On Eco mode and no load, the 56200i generated only 57.5dB, which was as quiet as the Yamaha EF2000iSv2 inverter generator, and was quieter than most more expensive 2000W models. The decibel level under no load with Eco Mode turned off was 60.5dB. And under full load, the decibel level we measured by a decibel meter was 69dB at 20 feet. We would say this is very comparable to the Yamaha, and you can barely realize the difference between them. As an inverter generator, the 56200i limits total harmonic distortion to under 0.3 percent at no load and under 1.2 percent at full load, making it safe enough to run laptops, phones, monitors, tablets and other vulnerable electronics. The generator produces 2000 surge watts and 1600 rated watts. We were also very impressed with the fuel efficiency of this quiet portable generator. With just 1 gallon single tank, it is able to run roughly 9 hours at 25% load and 4 hours at full load – ideal for maintaining overnight power. Does it mean the Wen 56200i is more efficient than the Honda EU2200i? NO! The reason behind this is that the Wen has the much less powerful engine and produces less power than the Honda (the Wen has a 2HP engine while Honda’s is 3.6HP). But running up to 4 hours at full load on just a 1-gallon tank is still very impressive for such a cheap 2000W portable generator. The WEN 56200i comes equipped with two three-prong 120V receptacles, one 12V DC receptacle, and one 5V USB port. Indication lights on the front of the panel provide overload and low-oil warnings. The automatic shutter controls the intake of gasoline to match the wattage at hand, maximizing fuel economy. The 56200i is Parallel capable, allows you to link up two generators for doubling the power output. The WEN 56200i inverter generator is by far one of the best and quietest portable generators that we’ve ever found and tested. It’s quiet, lightweight, and easy to use. And for the price, it’s unbeatable! 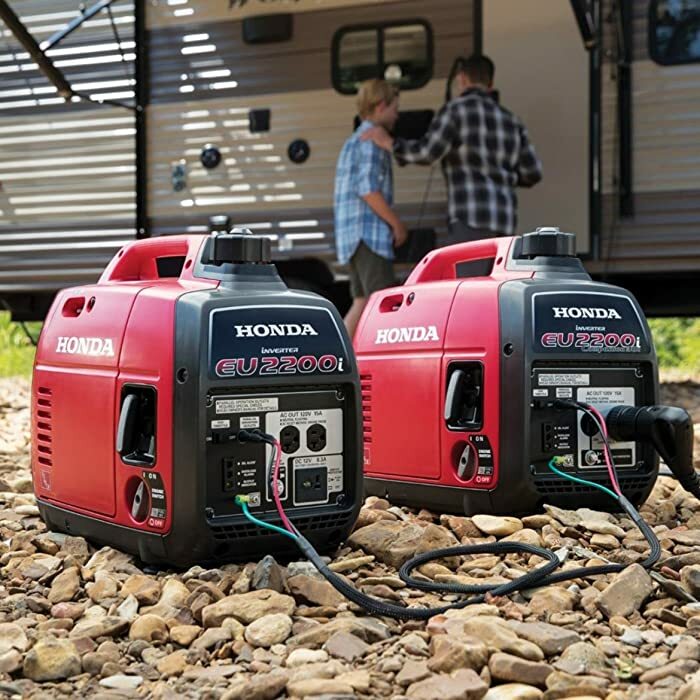 When it comes to the best portable generator for camping, most camping enthusiasts recommend models from Honda and Yamaha. They are generally more fuel efficient, more versatile, and much quieter than generators from other brands. We would say you can’t go wrong with either of those two. They get so many positive reviews from both owners and fellow professional reviewers. And the fact that we’ve heard very little negative feedback from users about Honda’s and Yamaha’s generators. The EF2000iSv2 is one of the best and quietest generators from Yamaha. It was just about 0.5dB louder than the Honda EU2200i at no load and about 1dB at full load. We think this Yamaha generator is as loud as the Honda 2000 watt unit. They are both great units and both will serve you well. But the Yamaha beats Honda when it comes to portability and fuel efficiency. The Yamaha EF2000iSv2 inverter generator weighs in at 44.1 pounds, making it easily portable. It’s packed with 1600 watts of running power and 2000 watts of starting power. It will run up to 10.5 hours at 25% rated load, 7 hours at half load, and 4.2 hours at full load, on just a 1.1-gallon tank of gasoline. This means when the fuel tank is full the EF2000iSv2 will allow you to power several different power tools or small appliances throughout the day. The EF2000iSv2 also features “Gasoline petcock” that lets you shut off the gas to run the carb dry for storage and helps prevent stale gas problems. Additional features include an Oil Watch Warning System to prevent engine damage, a 12-volt DC outlet and included cables to charge any 12-volt battery. Easy-to-read fuel gauge. The parallel function lets you connect an additional generator for extra amperage. You can NEVER say that you have never heard of Yamaha! Just like their cars and other equipment that they produce, this quiet portable generator is made with the same quality and reliability in mind. The Yamaha EF2000iSv2 inverter generator, in our opinion, is the only competitor of the Honda 2000W generator in terms of quality and reliability. The Honda is more powerful, but the Yamaha is more fuel efficient. Both always deliver power constantly and reliability. And more importantly, both are super quiet. 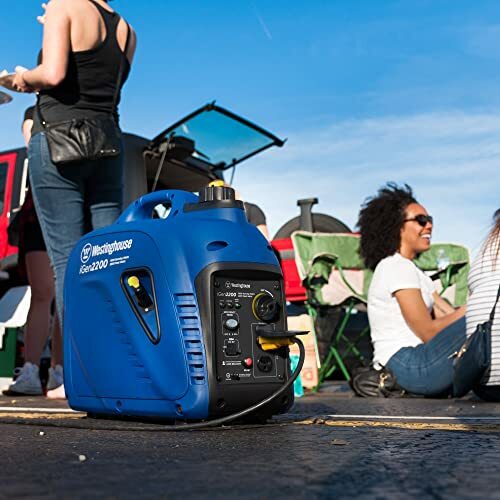 The iGen2200 inverter generator is one of the Westinghouse’s quietest and best selling portable generators. This inverter generator has a very lightweight and compact design and it has a suitcase-style handle allows for easy transportation. The iGen2200 has the same capacity as the Honda EU2200i but it’s about 0.5 pounds lighter and has a bigger fuel tank – up to 1.2 gal – which allows the generator to run entirely the day on a single tank. This generator has a small footprint and takes up little space, so if you’re after a small generator that is easy to store and transport, look no further! The iGen2200 was pretty quiet in the noise test. The noise level it produced at no load and Economy/Efficiency Mode turned on was 58dB, at no load with Eco Mode turned off was 61dB, and at rated-load was 70dB. It was as quiet as the WEN 56200i under Eco Mode (or Efficiency Mode) and 1dB louder under full load. This makes sense because the iGen2200 delivers 200W more power than the WEN 56200i. The iGen2200 is quieter than most portable generators in its class and we think if you’re looking for the best quiet portable generator, this is one of the top choices. The iGen2200 inverter generator 2,200 peak watts and 1,800 running watts, making it perfect as an emergency backup for home use or for recreational uses such as camping and tailgating. It weighs in at 46 pounds. A 4-stroke OHV Westinghouse engine allows the generator to run 30% to 50% more fuel efficient than a traditional generator. Under Efficiency Mode with a 1.2 gallons fuel tank, it is able to run up 12 hours at 25% load, 8 hours at 50% load, and 3.4 hours at rated load. This is very impressive for its compact size! If you’re looking for the best camping generator, the Westinghouse iGen2200 is a great option to consider. It is one of the quietest portable generators you can buy. It seems to be very sturdy and well made and we think it will serve you very well for years to come. The Ryobi Bluetooth 2,300-Watt Digital Inverter Generator features Bluetooth technology which allows monitoring power usage, run time, fuel level in real time and even remotely shut off your generator from your smartphone. It has plenty of great features and it runs very efficiently that will give you enough runtime to cover the majority of your recreational needs. This generator runs relatively quiet at just 71.4 decibels at full load and much quieter (58.3dB) at Auto Idle/Eco mode and no load. There are several quieter models, but this is still impressive. The Ryobi 2300-watt Bluetooth Generator features an 80cc OHV 4-Cycle engine that pushes 2300 starting watts and 1800 running watts. Ryobi makes this generator parallel capable, so you can hook up a second one and get 3600 running watts. The generator has two 120V 20A outlets, as well as two 2.1A USB outlets for your laptops and smartphones. These aren’t GFCI protected outlets, so keep an eye on the weather and nearby water sources when you’re using it. The Ryobi 2300-watt Bluetooth Generator looks small, but it’s the heaviest portable generator in our lineup. It weighs 53 pounds – almost 10 pounds heavier than the Yamaha EF2000iSv2 – but it has a couple of handles at the top and dual rear wheels for easy rolling around. With a 1.2 gallons fuel tank, this inverter generator will run for 10+ hours at 25% load; 7.5 hours at 50% load; and at rated load it can run for 4.2 hours. 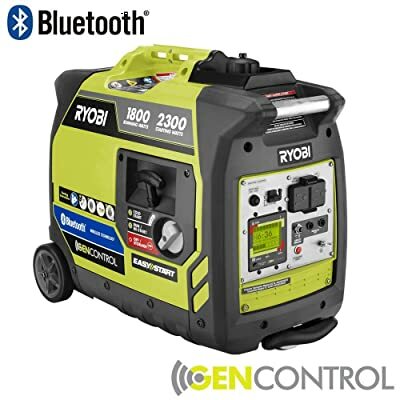 This Ryobi generator features Bluetooth technology, but unlike portable Bluetooth speakers which allow you to stream music via an app on your smartphone, you can’t start the generator with the Bluetooth. Bluetooth is only to monitor power consumption, fuel level, runtime remaining as well as stop the generator. 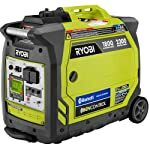 The Ryobi 2300-watt Bluetooth Generator wasn’t the quietest generator in the noise test, but, it’s definitely one of the best quiet portable generators available to buy today. And with Bluetooth, it’s smarter than most other portable generators. 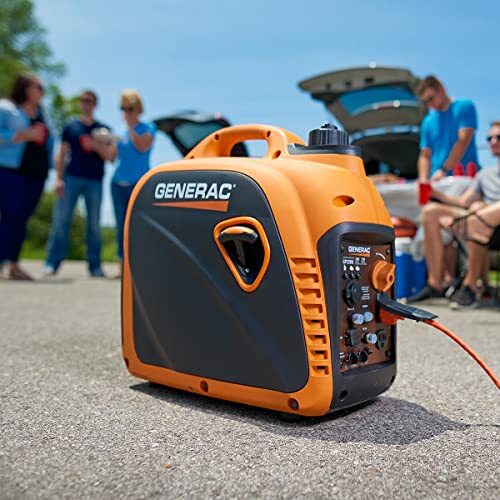 Generac makes some of the best quiet portable generators that are at a reasonable price, such as the GP2200i portable inverter generator. The GP2200i has the same capacity in the same lightweight, compact package as the Westinghouse iGen2200. This design is the primary selling point of these both portable generators. It’s easy to transport, store and use, making it a good choice to take on camping trips, a backup supply for short power outages or just to be prepared for those just-in-case scenarios. But if we have to choose between this Generac generator and the Westinghouse iGen2200, we’d pick the Westinghouse! Why? Because in the performance test, the Westinghouse ran smoother and handled a heavy load better than the Generac. And the Generac was also louder than the Westinghouse. The Generac GP2200i ran relatively quiet at no load with Economy mode turned on, it produced 59.6 decibels of sound at 20 feet. But when running at full load with Eco Mode turned off, the decibel jumped to 72 decibels – which was 2dB louder than the Westinghouse, and much louder than the Honda and Yamaha – but this was still on the quiet side. Most portable generators in its class fall somewhere between 75 and 80 decibels. This GP2200i produces about 1,700 running watts and 2,200 surge watts. This is more than enough to power for simple things like small appliances like microwaves or a mini fridge, as well as electronic devices like laptops, tablets and smartphones. The generator is equipped with a 1.2 gallons fuel tank allows 10.75 hours of run time at 25% load, 7 hours of runtime at 50% load, and 3.3 hours at rated load. One more thing to note about this model is that it comes with a parallel kit, which means you can hook two of these generators together for twice the power. The Generac GP2200i wasn’t the quietest portable generator we reviewed, but it’s a good quiet portable generator to buy. It’s great for taking on overnight camping trips or as a short-term backup power supply for smaller items. It has a unique design that makes it very portable and easily stored. The Briggs & Stratton P2200 PowerSmart was the loudest portable generator in our sound test. But it was reasonably quiet at light loads and even under heavy load it is much quieter than the open frame type generators. The thing we love most about this portable generator is that it’s very powerful. Under heavy load it ran smoother than most other portable generators in its class. It seemed as powerful as the Honda EU2200i inverter generator, but the price was much cheaper. From 20 feet, we measured the Briggs & Stratton P2200 operated at 60 decibels at with no load with Economy Mode turned on. It was pretty loud when operating at full load with the decibel level measured was 74 decibels. 74dB is the decibel rating at full load of some of the quietest 3000 watts portable generators, such as the Honda EU3000is inverter generator. But as we were saying, this is still much quieter than the open frame type generators. The Briggs & Stratton P2200 produces 1700W running power and 2200W peak power from a 111cc OHV engine. It has a 1-gallon fuel tank. The best running time you’ll get is about 8-hours at 25% load and 6.5-hours at 50% load. The Briggs & Stratton P2200 wasn’t as quiet as we expected but it’s still one of the best quiet portable generators on the market. It’s a great generator to buy if you’re looking for a powerful and reliable power source for your home backup or RV camping. Add to this, Briggs & Stratton has many years of experience building generators and it’s the name you can definitely trust. The Pulsar PG2000iS 2000W inverter generator was the cheapest model in our review. It’s also one of the cheapest 2000-watt portable generators you can buy. It’s cheap, but it turned out a quiet generator. We were really impressed with how quiet it was. 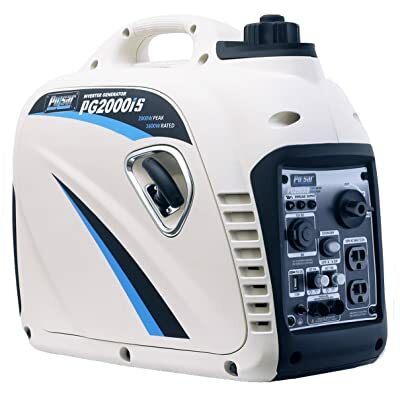 The PG2000iS was quieter than many more expensive models that we saw, and it was even quieter than the Briggs & Stratton P2200 inverter generator at full load. It’s so amazing for such a cheap generator! 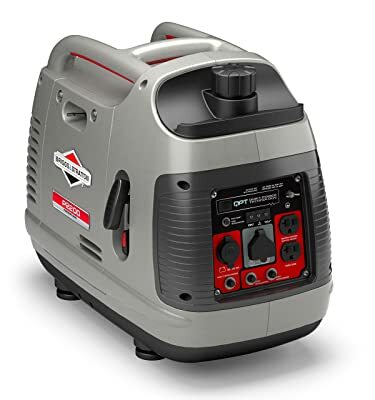 If you’re looking for a good quiet portable generator but don’t want to invest much in it, this Pulsar 2000 watts inverter generator is a decent option to purchase. The Pulsar PG2000iS was pretty quiet at no load with the Economy mode turned on. It generated just 59dB of noise from 20 feet, which was quieter than that of the Generac and the Briggs & Stratton. At full load, it generated 73dB of noise, which is considered fairly loud. But 73 decibels of noise exceeded our expectation for the one at only one third the cost of a comparable Honda. Weighing in at just 47 pounds and having a handy “suitcase” design, the 2000iS offers a great portability for outdoor power and entertainment use. It produces 2000 Peak watts/ 1600 running watts of power and is capable of up to 8 hours at 50% load on just 1.18 gallons of fuel. Features like the dual 120-volt outlets, 12V ‘cigarette’ outlet, and direct connect USB port provide you with pure, safe electrical power perfect for cellular devices, laptops, and other mobile devices. This inverter portable generator is parallel capable allows you to easily connect 2 units together for increased power output. 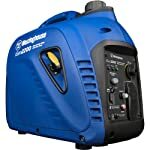 This is one of the best quiet portable generators to purchase if you’re on a tight budget. It is small, lightweight, and easy to use, and it seems to be very sturdy and well made. And on top of all this, it has a very affordable price. The Goal Zero Yeti 1400 is a solar generator. It has a built-in high-capacity Lithium-Ion battery that is packed with a 1425Wh of power, in a lightweight and compact package. The battery recharges by connecting to a compatible solar panel and a small MPPT solar charge controller. This solar generator is a perfect alternative to a 2000 watts conventional generator. As it doesn’t use gasoline or propane, it has no noise as well as no emission. It’s safe enough to store inside your home or apartment for running lights or appliances during an emergency power outage, and still durable enough to take along to your next outdoor project. The Yeti 1400 features a 1425Wh capacity (132Ah/10.8V, 396Ah/3.7V) with various high-power 120V AC, USB, USB-C, USB-PD and 12V outputs capable of running 10 devices at once. With these 10 versatile ports, it keeps all the necessary gear powered up anywhere. It features higher surge capacities for greater compatibility with more power-hungry devices, and the latest in USB-C Power Delivery capable of charging larger USB devices like laptops. 32 LCD TV: 14 hours. With Wi-Fi connectivity, you can control the Yeti 1400 remotely via Goal Zero Yeti App – which available on both Apple Store and Google Play Store. Through this app, you can turn ports on or off, check battery levels, even update the Yeti’s firmware with your chosen device. With no noise at all, the Goal Zero Yeti 1400 Lithium is definitely the quietest portable generator you can buy. If you need power that comes in a small size, easy to move around, quiet enough to use in any campsite or national park, this is the one to own.